Essential oils are distilled, aromatic oils that have the characteristic and fragrance of the plant from which they are derived. They are distilled from seeds, bark, stems, roots, flowers, and any other part of a plant you can think of. When you smell the amazing fragrance of a tulip, or take in the powerful and energizing scent of an orange before you eat it, you are being pleased by the gift of the essential oils in those plants. The essential oils of plants not only make them smell good, but give them unique benefits and characteristics that protect the plant and keep it healthy. It makes absolute sense that these benefits would extend to keeping us healthy! Essential oils have been used all throughout history for medicinal and therapeutic purposes. Ancient Egyptians were the first to discover the unbelievable benefits. As early as 3,500 B.C., they used Mesopotamia’s distillation pots to extract the oils from herbs and plants. Aromatherapy was regularly included in their health regimen. Essential Oils can immediately and therapeutically penetrate the skin and cell membranes to provide instant relief. Not only do they penetrate immediate, they go right through the blood brain barrier. This reaches parts of the brain that control emotions, thus certain oils can organically help us with anxiety, stress, and mood. Essential oils contain oxygen. These oxygen molecules go through your system and can transport nutrients and oxygen to cells that are low. Essential oils are incredibly high in antioxidants. Antioxidants fight free radicals and keep us looking and feeling younger. There is a scale called the Oxygen Radical Absorbance Capacity (ORAC) which measures the antioxidant capacity (basically how well a cell can absorb and remove free radicals). The ORAC value of Clove oil is over 1,000,000. To put it in perspective, kale is only at 1,770 on the ORAC scale. Essential oils can lower inflammation and stop pain throughout the body. They help the body to heal and make you physically feel better. Animals can even benefit from essential oils. Horses are often calmed with the use of essential oil aromatherapy. Certain essential oils are antibacterial and antiviral. Others are antifungal. This means that essential oils can treat these infections and dangers without the use of medicine with side effects. Tea Tree oil is a popular antimicrobial. Over 50 oils have anti-cancer properties. Dissolving a drop of peppermint oil under the tongue can even help the body from the inside by improving digestion and upset stomach. Grapefruit essential oil can boost your metabolism and help you lose weight. Every oil has its own amazing power! How Can You Incorporate Essential Oils Into Your Daily Regimen? Ideally, you’d like to target your largest possible organ for absorption: your skin! Lathering your body with therapeutic body lotions, creams, or butters that contain essential oils will allow the oils to cross right into your cells and blood stream. This will provide maximum effect after a shower when pores are open from the heat. Using Organic Bath Co.’s “Stress Less” butter, you can allow the benefits of Lavender Essential Oil to heal your body and relax your mind. Lavender essential oil relaxes muscles and stops aches. It is incredibly helpful for acne due to antibacterial properties (this could potentially moisturize and heal body acne in areas such as the back). 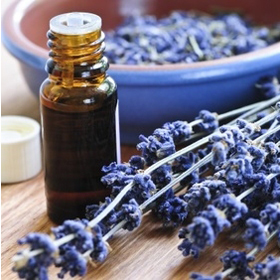 Lavender essential oil has also been used in the treatment of eczema and other skin issues such as burns and cuts. Incorporating lavender essential oil into your moisturizing routine daily over time could even lessen problems with anxiety due to the daily relaxation and serenity it provides to the amygdala of the brain. The value of essential oils is absolutely underappreciated, and more of us should be utilizing these sweet-smelling tools for healing!